Declining equity volatility appears contradictory to rising recession risk. December’s volatility was associated with high equity correlation, not with high dispersion that has accompanied larger declines in the past. Volatility could subside further if equity trajectory is similar to previous post-decline instances. High valuations, even if they don't predict equity prices in the short term, could cause volatility surges. US equities have regained the top of their October-December trading range. 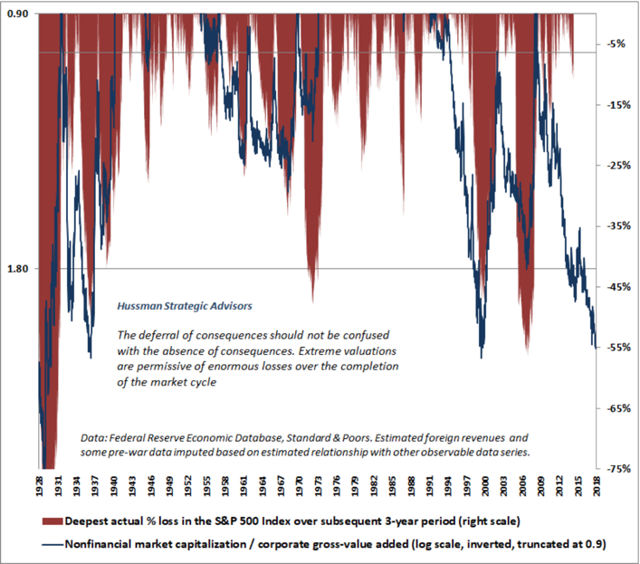 In the middle of that dramatic move is a much-discussed yet seldom observed market phenomenon: The nearly unblemished V of a waterfall decline and immediate recovery. As traders (those on the long side, at least) heave a sigh of relief, they can draw some useful lessons from the reversal. The speed and breadth of the recovery provide at least a tentative insight about the preceding drop. December equity markets had unusually high correlation along with below-average dispersion, as Fei Mei Chan showed in an analysis from S&P Global. 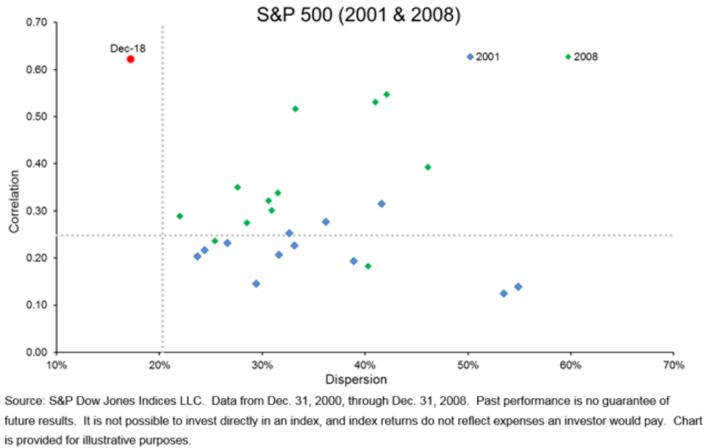 A similar comparison of full-year results showed that equity dispersion was much higher in years when the S&P 500 index fell. Several US equity indexes have scored nine straight weekly advances since the December lows. 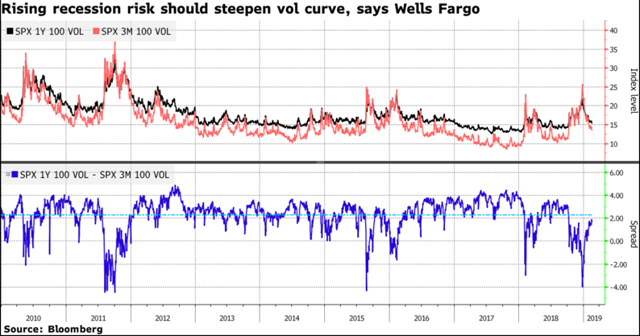 Matching their stride, the VIX index of implied volatility of S&P 500 index options (loosely termed the equity "fear gauge") fell for the ninth straight week. The volatility of volatility index (VVIX) recently hit multi-year lows. 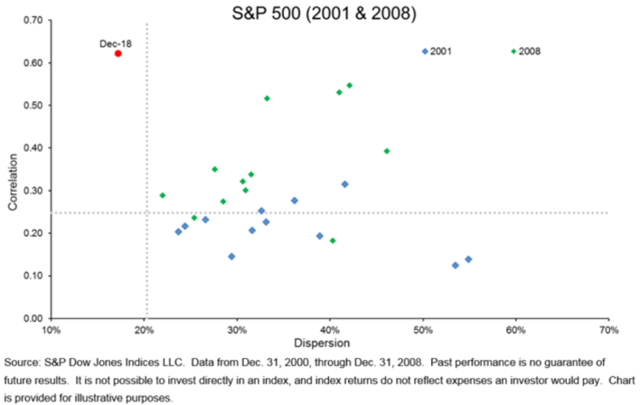 Lower implied volatility makes it less expensive to use options as a hedging strategy. Investors have duly increased their purchases of call options, which help to protect recent gains in stock prices. 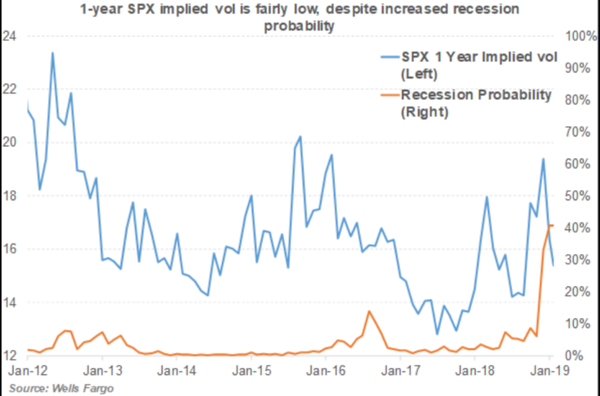 Although the decline in volatility brings a welcome calm spell, it seems to contradict a recent increase in recession probability for the US. Such measures vary, but some rose to multi-year highs in late 2018 and remain elevated. It's worrisome that they have crossed paths with the VIX. The volatility term structure should be steeper to reflect the disparity between calm current conditions and the near-term likelihood of recession, observes Pravit Chintawongvanich, a Wells Fargo equity derivatives strategist. That problem might fix itself, assuming the relatively flat volatility curve has more to do with December's turmoil than with near-term conditions. If equity markets keep calm and carry on, the declining 3-month index (red trace in chart below) will bring a steeper term structure. And the low 12-month index (black trace) suggests that options traders are less worried about recession than other market participants are. Who is right? It could be that conventional recession indicators currently overstate the actual risk, because monetary policy has affected the yield curve in ways that differ from past cycles. Or the indicators may be slow to account for changing financial conditions. Different proprietary indexes show that most or all of the tightening financial conditions that occurred between September and December have been reversed. The late-2018 malaise now looks like a short-lived outbreak of Seasonal Affective Disorder (SAD) around the winter solstice. Loss of confidence can be a major recession risk in itself. This is a likely reason for the recent dovish turn in Federal Reserve policy: to snuff out the fear fuse. Things look brighter in the new year, at least according to equity and credit markets. Characteristics of the stock rebound so far - notably market breadth - indicate that it is not just a bear market rally, as strategist Urban Carmel reasoned in a blog post. A retest of the December equity lows, which would push volatility back up, can't be ruled out. But an outright break of the lows is unlikely in the near term unless the recession indicators are, in fact, not pessimistic enough. 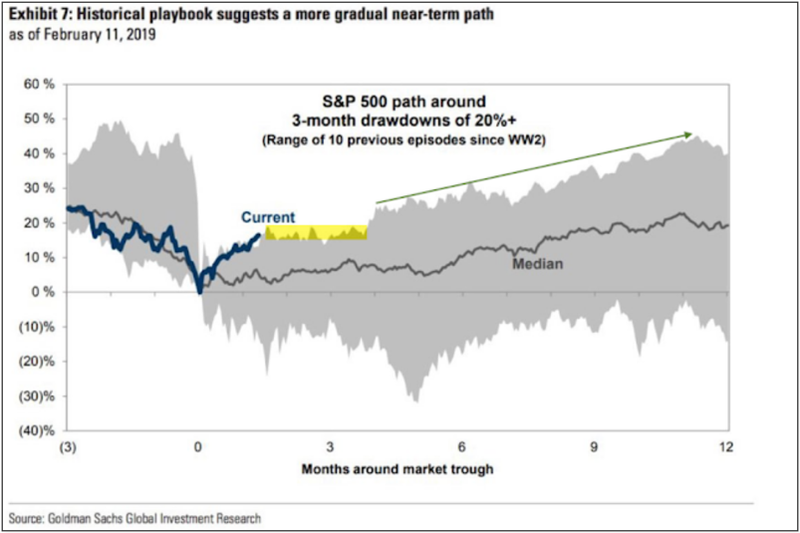 Based on similar "V" patterns in the past, Goldman Sachs expects a more gradual path for equities. A range-bound market would likely hold volatility at moderate levels. If instead the stock index drops back toward the median of previous instances, volatility would likely rise before steadying. Last year, two volatility spikes book-ended US equity price action: in February when speculation in the inverse-VIX complex blew up, and the December climax of a fear avalanche in risk assets. If neither episode preceded a bear market or recession (which we might know by the end of this year), then why has the market been so prone to volatility? And will it come back, as a Neuberger Berman model indicates based on "volatility clustering"? High valuations may have fanned the flames in both of the 2018 conflagrations. Contrary to widespread belief, valuations can matter to stock prices over fairly brief intervals. 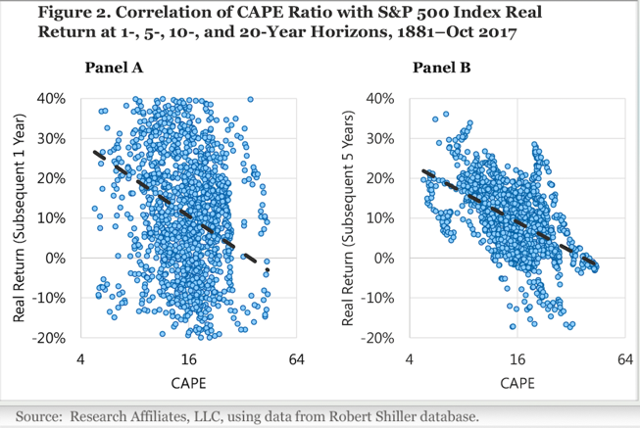 Research Affiliates analyzed equity returns relative to the Schiller cyclically adjusted price/earnings (CAPE) ratio, and found a negative correlation across a wide range of time horizons. The relationship is just less predictable for a one-year horizon, as the wide scatter of the Panel A plot shows. It's intuitive that the dots toward the lower right, which pull down the regression line, are associated with higher volatility. By short-term measures, valuations are fairly reasonable now. The re-rating last year brought forward P/Es into the middle of their range of the past 25 years. But valuations have been historically high, and stock prices above trend, for most of that interval. Longer-term measures remain stretched, as fund manager John Hussman emphasized in a market commentary (from fall 2018, before the near-20% drawdown in the S&P 500). As the chart above shows, some of the biggest market declines follow extreme valuation levels. So rising stock prices, if unsupported by fundamentals, are a temporary blessing at best. Volatility is a fear factor that holds back all but the most irrational of exuberance. That's why we don't want the proverbial wall of worry to disintegrate under our sweaty palms.